Martin de Kniff was born on October 2, 1972, in Gothenburg, Sweden. Martin is known as “The Knife,” a play upon his last name. He first played poker with his grandmother when he was seven. Martin de Kniff moved from Gothenburg, which means Falcon Mountain, to Stockholm in 1992. Martin de Kniff would play poker and bridge in the card clubs around Stockholm. When he was 21, Martin became the youngest ever Bridge Life Master in Sweden. Martin de Kniff’s biggest poker success was his World Poker Tour Title which he won in 2004 playing in the Season 2 WPT Championship. This earned him the first place prize of $2,728,356. 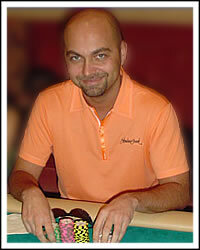 Martin had a 13th place finish in the 2002 World Series of Poker Main Event and as of 2008, Martin de Kniff had accrued more than $3.3 million playing poker. Martin de Kniff enjoys playing golf and betting on European soccer matches. Away from poker tables, Martin is also an avid bridge player. He was placed second in the 2008 Blue Ribbon Pairs.